Brownie's Yacht Toys has all your favorite Scuba gear and diving equipment from the best in gear manufaturers- Scubapro, Halcyon, Hollis, wet and dry suits, dive computers, tanks, rebreathers, spear guns, med kits and more great dive gear. Contact Us and we can answer your price and model questions. Brownie's YachtDiver is a platinum dealer for Scubapro. As a platinum dealer Brownie's YachtDiver offers not only the best dive gear in the world but all warranty, service and training as only you would expect from an elite dive gear store would. Got to the Scubapro Page on the YachtDiver web site for all the info. Halcyon Dive Systems has great gear for both recreational and technical divers. Halcyon Dive Systems has all the gear for whatever the need or challenge for successful diving. See more on the Halcyon Page on the YachtDiver web site. 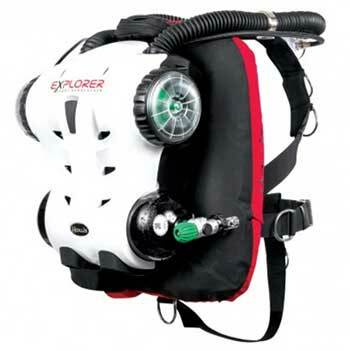 Brownie's offers the Prism Rebreather by Hollis for recreational divers. This new model rebreather takes advantage of all the latest technology for easy and safe rebreather diving. See more on the Hollis Prism 2 page. Brownie's YachtDiver offers all dive gear and accessories as well as yacht toys from three locations, two in Fort Lauderdale and another in Palm Beach, Florida. Visit the Brownie's YachtDiver web site for more information and to see the latest in dive gear.